Over at Circle of Blue, where I serve as senior editor, we’ve been working on Choke Point: U.S., a series of original articles about the tightening contest between rising energy demand and diminishing supplies of fresh water. In our latest chapter, we explored the big boom in oil and gas production on the northern Great Plains, where energy companies are tapping the “unconventional” Bakken Shale. Two miles beneath North Dakota, and below parts of Montana and Saskatchewan is the 200,000-square mile Bakken Shale, a layer of tightly squeezed carbon-saturated rock. The US Geological Survey conservatively estimated two years ago that the Bakken formation contained over 4 billion barrels of recoverable oil, and tens of billions of cubic feet of natural gas. Below the Bakken lies another layer of oil shale known as the Three Forks that also shows signs of being a big oil producer. Industry petroleum engineers say the Bakken alone contains many times more oil and gas than the government estimates. Whatever the case, the Bakken has set off a frenzy of fossil fuel exploration and development that is turning the northern Great Plains into one of the nation’s primary oil and gas producers. This year North Dakota will produce over 100 million barrels of oil – triple what it produced in 2004. Only Texas, Alaska, and California produce more. Three years ago, North Dakota was barely in the top ten oil producers. The state this year also will produce about 100 billion cubic feet of natural gas, putting it 19th among states. 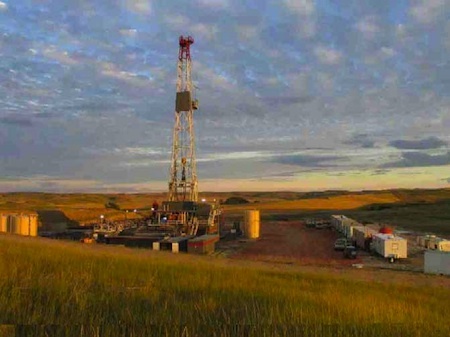 In North Dakota, almost 150 oil and gas drilling rigs are operating this month, nearly tying a state record, and more rigs than all but two other states. Thousands of oil field trucks jam remote two-lane highways that not long ago were so empty people could virtually picnic on the centerlines. More than 7,000 laborers from other states have migrated to North Dakota’s oil and gas fields, according to the state Job Service, but the state unemployment rate has dropped to 3.6 percent – the nation’s lowest. When North Dakota’s budget cycle ended in June, Budget Director Pam Sharp reported an $800 million surplus. “It just almost boggles the mind,” the state’s top oil and gas regulator told a veterans group in Minot on September 2. “It is not like the traditional oil and gas play.” Just how different is illustrated by these statistic: Oil wells in the Bakken Shale are capable of producing 4,000 barrels a day or more, according to state figures. Just one in 100 wells drilled into the Bakken Shale fail to yield marketable quantities of oil or gas, according to industry executives. America isn’t addicted to oil, as Presidents George W. Bush and Barack Obama have contended. Rather, America’s relationship to oil more closely resembles insistent devotion, so much so that as the last barrels are being sucked out of the “conventional” pools of oil that lie below the land and sea, American energy companies are working at a frenzied pace to accelerate the next era of hydrocarbon development. They are spending hundreds of billions of dollars annually to tap, transport, and process fuel from what the oil industry and government engineers call “unconventional” reserves – the tar sands of northern Alberta, the oil shales of the Great Plains and Rocky Mountain West, the gas-bearing shales of Texas, the Upper Great Lakes, and the mid-Atlantic states. These and several more carbon-rich reserves around the nation contain trillions of barrels of oil – more than is currently recoverable from conventional reserves — and hundreds of trillions of cubic feet of natural gas. Though geologists have been aware of their existence for decades, the persistently high prices for oil and gas over the last decade, and the industry’s bet that they will remain high, have made unconventional reserves profitable to pursue. The federal government and states are more than happy to encourage the development with billions in direct grants, tax incentives and subsidies. But the risks to the nation’s well being are stark and disturbing. Oil and gas production from unconventional reserves is extending the profligate and polluting fossil fuel economy. More importantly, turning sand and rock into oil and natural gas is producing more damage to the land, more climate-changing emissions, and using more of the nation’s diminishing supplies of fresh water than the conventional reserves they are replacing. No one in the oil and gas industry, and few charged with regulating its practices, seem to care. The scale of the industrial enterprise racing to tap, transport, and process the fuel is immense, expansive, and growing. Natural gas developers are injecting billions of gallons of freshwater under super high pressure into deep gas-bearing shales in the Northeast, Upper Midwest, and Texas and Oklahoma to fracture the rock and are now producing more than half of the nation’s natural gas. The annual investment – more than $80 billion. American energy companies, joined by their European, Canadian, Chinese, and Korean competitors, are spending $15 billion annually to turn the tar sands of northern Alberta into 1.3 million barrels of oil annually and production is increasing 10 percent a year. Most of that oil – 1.1 million barrels – is exported to the United States, where pipeline developers are spending $30 billion to move it to a network of U.S. refineries in the Great Lakes, the Mississippi River Valley, Oklahoma and the Texas Gulf that are undergoing $20 billion in expansions and modernizations. In North Dakota nearly 1,000 wells are being drilled annually at a cost of more than $7 billion. Enbridge, the Canadian pipeline developer, is spending $500 million to expand its North Dakota network. Amerada Hess is spending $500 million to expand one of its natural gas processing plants. Oil and gas developers, spurred by the North Dakota experience, are leasing hundreds of thousands of mineral rights in Wyoming and Colorado and starting to drill into the Niobrara Shale, a similar deep oil shale reserve. Many Americans, of course, have been aware since the 2008 presidential election that the U.S. was at the vanguard of a new energy era. They just thought it would be the transition to clean energy. And largely as the result of the $80 billion in grants and tax incentives contained in last year’s stimulus bill, the U.S. is indeed moving to the earliest stages of what could be a genuine low-carbon energy. Wind farms now account for more than 35,000 megawatts of generating capacity, equal to 35 big coal-fired plants. The first new utility-scale solar thermal plant in a generation was just approved in California, and state and federal regulators are reviewing applications for dozens more in that state, as well as Nevada, Utah, and Arizona. The auto industry is introducing more efficient hybrid-electric and all-electric cars, and in Michigan 17 new manufacturing plants are under construction or are permitted to make lithium lithium-ion batteries for the new vehicles. But what most Americans are not aware of is that a much larger, more dangerous, and more powerful unconventional energy era is well under way. Its principal aim is to perpetuate the fossil fuel age they know best and actively encourage. My spouse and i have been looking into solar power for nearly a yr and as a consequence my spouse and i finally made the actual commitment primarily based upon the combination of governtment incentive plans not to mention exceptionally cost-effective financing. The two of us have now already been checking into solar for around a calendar year and as a consequence we eventually made the commitment based upon upon the combination of the governtment incentive packages along with incredibly cost efficient loans. I actually can’t imagine how economical it all was so my spouse and i already have been a new solar powered family for approximately one 4 weeks and consequently almost everything seem as if it all is in fact working out excellent. We can basically observe just how much electricity my spouse and i aer conserving each single night and it is really quite amazing. I alway presumed that photo voltaic appeared to be promoted with a whole lot of media hype but We may easily convey to everyone the fact that the product is undoubtedly the real deal. We wish we had done it a long time ago.